The Dover Saddlery/U.S. Medal Finals kicks off today here at the Farm Show Arena in Harrisburg, Pa., at 7 a.m. The estimated start time for the final round is 4:15 p.m. 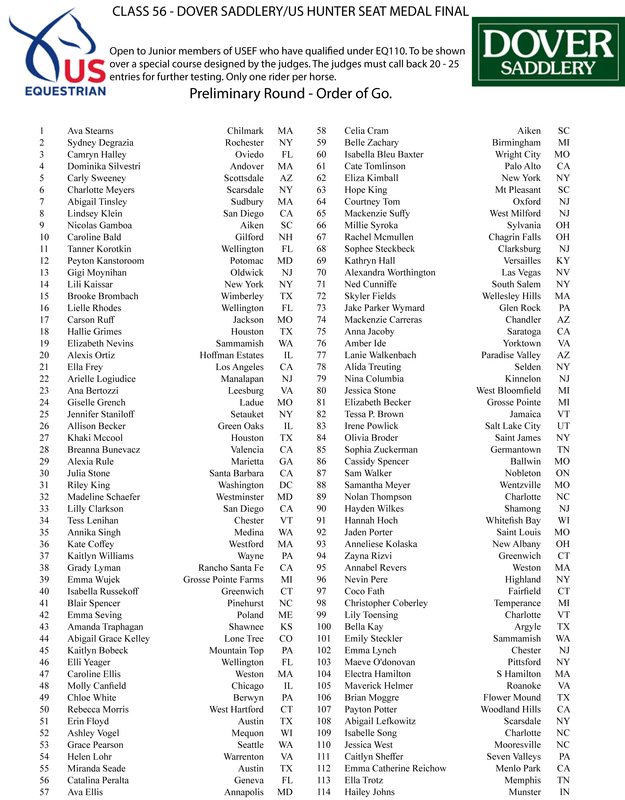 There are 241 competitors riding for a chance at one of the most prestigious equitation titles around. That’s 16 fewer starters than last year. Robin Rost Brown and Geoff Teall will be judging today, and they also designed the course. The Chronicle is ringside live blogging throughout the day, and you can follow along here. A full description of the first-round course is below, along with a course map and a photo of the course. The order of go is posted here. 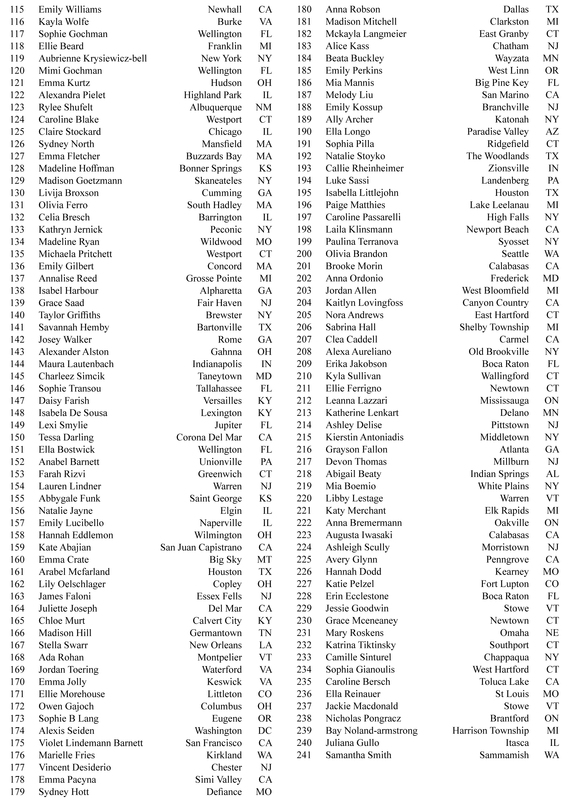 You can watch the live feed on EQSports.net or on USEFNetwork. We will have full in-depth analysis of the competition in the Nov. 5 issue of the magazine. The course was designed by judges Geoff Teall and Robin Rost Brown. Riders start over a birch oxer, then continue through the corner to a vertical with no wings. Riders loop around to the fence 3, a rolltop, ridden on a bending line to an oxer with no ground line on a bending line to another rolltop. Riders turn back on fence 6, an oxer, then continue through the corner to an in-and-out, labeled 7AB. They continue on a bending line to an airy Swedish oxer in the middle of the ring. Then they go through the corner and jump a triple bar. They have a bit of a breather before jumping the final line, fence 10 (it’s fence 5 backwards) in four strides to an airy oxer with no groundlines and no wings. 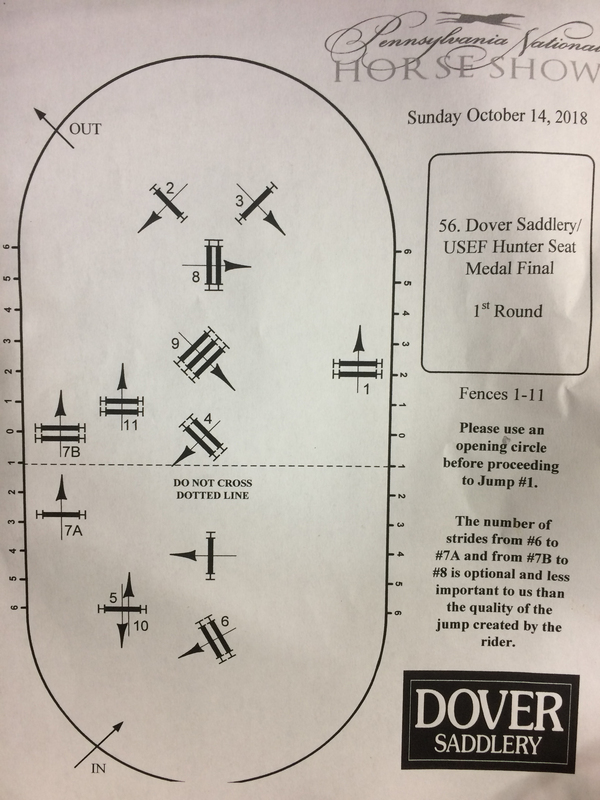 Interestingly, the judges have put a note down saying that between 6 and 7A and between 7B and 8 they’re less concerned with the number of strides than with the quality of jump. In other words, the add is OK if the jump looks good.